Since the invention of the barometer by the Italian scholar Evangelista Torricelli (1608-47) in 1644, early scientists had been trying to determine the thickness of the atmosphere. By the end of the 17 th century, scientists knew that air pressure decreased with height. It seemed logical that at some altitude there would be no pressure at all and they would have reached the top of the atmosphere. Of course, people could not actually get to the top because they would run out of air first. An equation to calculate the atmospheric thickness was not easily created either. Air temperature cools with height as the molecules move farther away from each other, and so air temperature affects air pressure. In order to determine atmospheric thickness, scientists would need to get instruments to a much higher altitude than they could safely reach by climbing mountains. Using balloons to carry instruments aloft, the French scientist Léon-Philippe Teisserenc de Bort (1855-1913), founding director of the Observatoire de Météorologies Dynamique de Trappes (Dynamic Meteorology Observatory of Trappes), discovered in 1898 that the atmospheric temperature steadily decreased up to 6.8 miles (11 km) above Earth's surface. As the altitude continued to increase, the temperature remained constant (isothermal). Teisserenc de Bort was stunned by the results. He performed the experiment repeatedly, always getting the same measurement. After four more years of investigations, Teisserenc de Bort presented his discovery of the "upper inversion" to the Academy of Sciences in Paris. (Today an inversion is defined as a layer of the atmosphere that is warmer than the one below it.) The German scientist Richard Assman (1845-1919) confirmed the result. 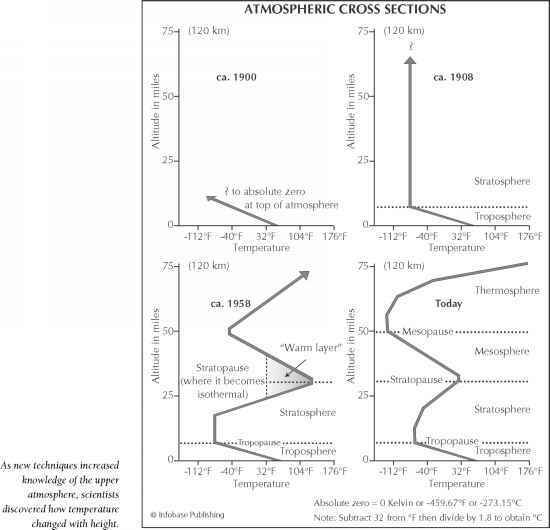 On the basis of these experimental data, in 1908 Teisserenc de Bort defined two atmospheric layers: the troposphere and the stratosphere. The term troposphere is from the Greek root tropein, which means "to turn or to change." 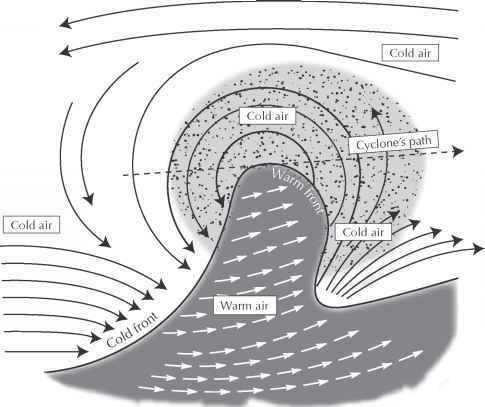 The troposphere is the region of the atmosphere closest to Earth where the air is constantly stirred or "turned" by the rising of warm air and falling of cold air. Teisserenc de Bort thought the troposphere was 6.8 miles (11 km) thick, but its thickness is not uniform and it varies with latitude and season. Warm air is thicker, so the troposphere is 9.3-12.4 miles (15-20 km) thick at the equator, but only 6.2 miles (10 km) thick at the colder poles. For the same reason, the troposphere is thicker in the summer than in the winter. Teisserenc de Bort chose the term stratosphere, or "even space," for the layer above the troposphere because the gases within it are undisturbed. The stratosphere includes the isothermal region (now called the tropopause) and extends to a height of 31 miles (50 km). Unlike in the troposphere, where temperature decreases with height, in the stratosphere the temperature either remains isothermal or increases with height. This discovery confused early investigators because it ran counter to the commonly held view that temperature always decreased with height. The French physicist Charles Fabry (1867-1945) proved in 1913 that the heating was due to large amounts of ozone gas (O3) in the upper stratosphere. 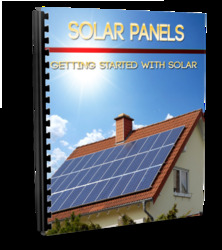 Stratospheric ozone absorbs the energy from solar ultraviolet radiation, preventing it from reaching Earth. The temperature at 31 miles (50 km) above Earth's surface is approximately 32°F (0°C) (freezing), while the temperature at 6.8 miles (11 km) is approximately -121°F (-85°C). With little air movement, the stratosphere provides a smooth ride for jets. Having determined that weather only took place in the lower 6.8 miles (11 km) of the atmosphere, scholars could most profitably spend their time focused on the movement of air within the troposphere. Discoveries of stratospheric characteristics would await improved instrumentation.